In previous forecasts I mentioned that, in a nutshell, 2008 was the start of a new 9-year epicycle. This epicycle would be centered around issues of political and economical mayhem, while 2009 pushed a search for common ground and diplomacy, and 2010 would be the year of leadership issues and a quest for clear direction and communication. Now entering the fourth year of this 9-year cycle, 2011 is dominated by the disciplined and controlled 4, a positive energy if it wasn't for its lack of vision and flexibility. Also influential are the 1 and the 0 creating obstacles and confronting us with some of our more taxing shortcomings. But before I go into detail in my predictions for 2011, I want to remind you that this is not your ordinary 9-year cycle. On the contrary, the period 2008 through 2017 will go into the history books world-wide as the decade of transformation during which the world changed more dramatically than in any period before. By now, everyone is aware of the Mayan calendar and the supposed prediction of "the end of the world" on December 21, 2012. Don't worry about that, you will wake up December 22, 2012, with the same hopes and worries you went to bed with. 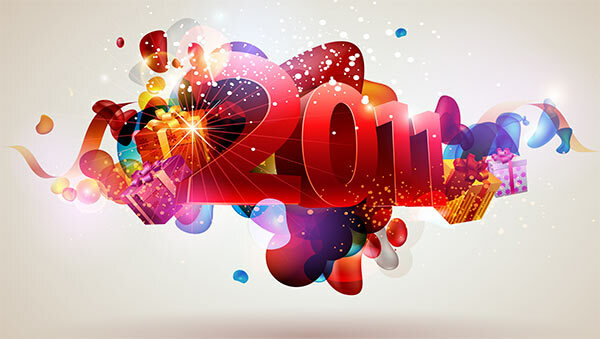 However, numerology clearly shows that the year 2012 is the pivot around which a metamorphoses of unprecedented magnitude hinges, even if the essence of this changing reality doesn't become clear until 2017. As I mentioned, 2011 centers around discipline and control. This sounds positive, but the way it plays out is not quite so wonderful as it expresses itself in a global narrowing of vision that lessens our ability to plan or to properly understand the impact of our choices and decisions. It is as if we handed the reins to a small-minded accountant who is bend over the books counting the beans without a clue what is going on around him or outside his office. The discipline, control, and eye for details is certainly there, the vision is not. As a result, those good traits such as discipline and control will actually have a negative impact on us. In fact, if you can imagine 2012 to be the pivot, 2011 is the last year when, figuratively speaking, all things flow downward. There will be confrontations over the most trivial disagreements. If most politicians today are considered narrow-minded and foolish, during 2011 the little bit of vision and greatness that managed to survive thus far, will be all but wiped out. Details are blown out of proportion, frustration rules, and tunnel vision becomes the accepted norm. There will be less progress and more regress. But let me widen the scope a little. Throughout the last dozen years or so, starting early 2000, the forces that be have become more polarized. This is revealed in part by the dominating presence of both, the 0 and 1, and the 1 and 2 patterns. These are numbers that push things apart and away. At best, they exist in a state of balance, at worst, they subsist in a permanent state of struggle. This continues to be a noticeable influence for the early part of this century and most significantly during the next few years. What this means is that the obvious forces in the political, military, and religious arenas, with all the conflicts and separations they cause, are only part of the picture while an underlying and more obscure evolution takes place away from the limelight and ignored by the media. And it is this covert evolution that will eventually save us from complete and total disaster. In fact, nowhere is the polarization of energies more prominent and powerful than between the superficial surface "reality" and the real evolution happening on a deeper and more humane level. Just as the sixties, when they happened, were largely misunderstood by the majority at that time, and its influence on the future radically underestimated, the aforementioned hidden evolution taking place today eventually brings a tidal wave of changes on every level. Its affect on the global society will be much more drastic than even the sixties. In fact, the sixties were no more than a teaser; the real "revolution" is currently underway. Unfortunately, the changes brought forth by this transformation won't come to light until we are past the pivotal year 2012. Suffice it to say that its origin can be traced back to the sixties and that those silly concepts of "flower power" and "love not war" will take on a whole new meaning, this time based on reality in the most rigid sense of the word, not the happy illusions of hippies and dreamers. Focusing on 2011, what this all means is that while the changes playing out on the surface seem to be pushing us towards our ultimate demise, the reality is that other forces are gently guiding and carrying us towards a more harmonious existence. However, that reality is hidden to the vast majority of the human race, at least for now, and therefore doesn't play much of a role on the practical and more visible stage. There, we will see stagnation, denial, and downright obstruction on a national and global level. More and more it appears that people focus on the differences between them, causing hateful rhetoric and violent encounters. As I mentioned before, the numbers reflect a widening of the gaps and this plays on all levels, including the economy. Even in developed countries and most visibly in the USA, the poor get poorer and the rich get richer. And that is not the biggest problem; the most problematic effect is that the percentage of people considered to be poor increases exponentially, while the middle class shrinks, typically considered the most obvious dilemma needed to overcome for third world economies. Religions, without exception, also become more polarized and this reflects itself in less tolerance and more dogmas. As a result, expect more violence in the name of God or Allah or whatever name. In fact, look at any aspect of human life, political, religious, or any other, and simply sharpen the angles and there is the picture for 2011. Looking at 2011 month-by-month, January stands out for the chaos and unexpected changes that will see us, figuratively speaking, reeling and scrambling to survive. Not so metaphorically will be the real danger of volcanoes, earth quakes, and other "acts of God" that we can expect during this month, with a second wave during October. February is more stable and brings some of our more basic needs to the foreground, especially family affairs and loyalty. The economy shows signs of improvement and one or more important medical breakthroughs give hope and brighten the future for many. March brings acts of religious fanaticism and other dangerous side-effects of spiritual and intellectual ignorance, including weird calls for book-banning, strange, if not completely absurd statements by religious leaders, and similar expressions of thoughtless, unconscious behavior. April is ruled by an 8 and brings a measure of balance, but also sees more violence and aggression, especially by and against authority. May has a calming effect and brings progress in many areas but mostly in politics and diplomacy, including a genuine effort to bring peace to parts of the world where harmony has been a rare commodity. June and July bring a surge of energy, not unlike shifting into a higher gear, with some sensational and history-making events, scientific breakthroughs, and a boost to the global economy. August has a more creative energy, while September puts the brakes on everything and is the month most illustrative of the energies and influences of the year 2011 as described before; including the lack of vision and the emphasize on trivial matters. October is disruptive and brings turmoil not dissimilar to what we saw nine months prior during January, while November brings a more compassionate energy. December will go down as the month when, to use an analogy, a new voice is first heard world-wide, a voice of reason, a voice of humanity, a voice of hope. For those of us who can read the subtle signs, it offers the first glimpse of the hidden evolution I mentioned earlier. In a way, December is a precursor to what the second half of this nine-year cycle brings.